This Saturday, June 12th punk and ska will be taking over The Loving Touch. Mustard Plug and the Voodoo Glow Skulls will be hitting the stage! This is not your usual Saturday night lineup at The LT, it's nice to see them doing something different. They are taking on some of the shows that would have been a The Magic Stick and I think it is a win, win for all of us. The LT has a much better sound system, better/cheaper drinks, and there is always a working bathroom when you need it! 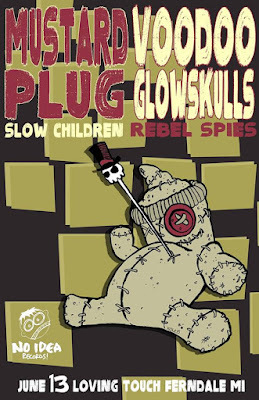 These two veteran punk acts will be playing alongside Detroit's own Rebel Spies and Slow Children from California. Tickets are $13 in advance and $15 at the door. All ages are welcome to come out and play and doors for the show open at 8 p.m.
We also have a pair of tickets to give away to the show courtesy of the ladies over at Black Iris Booking. If you would like to enter to attend the show for free, please email your full name to hipindetroit@gmail.com with Mustard Plug in the subject line. We will draw a winner the morning of the show and email them details on how to claim their prize.